Over the course of a year a net-zero home will generate as much energy as it consumes. They've been around for less than 10 years, but these buildings and the thinking behind them are taking North America by storm. A net-zero home is more than just a place to hang your hat - it's a super-efficient, solar-powered look into the future. It was Le Corbusier, the Franco-Swiss modernist and founder of brutalism who coined the term "buildings as machines for living." The net-zero home is far more deserving of the term than the bare concrete structures that "Le Corbu" made famous. Net-zero homes started as a glimmer in the Canadian Housing and Mortgage Corporation's eye. They developed a pilot program back in 2004 and it led to the Riverdale net-zero project being completed in Edmonton, in 2007. 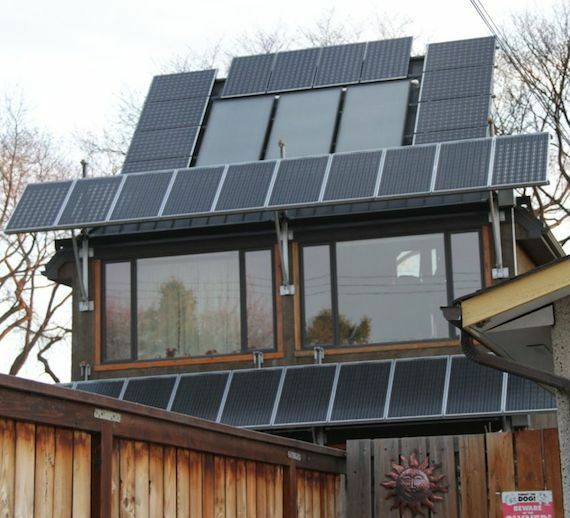 Peter Amerongen built the Riverdale house, one of the first net-zero homes in Canada, with the help of a team of 45 professionals and volunteers. Amerongen has been building homes for more than 40 years and has been interested in energy efficiency since the oil crisis in the '70s. The Riverdale project is a duplex with a large solar thermal array that aimed to cover the house's space heating needs. Getting it built was a key first step in making net-zero mainstream. The lessons learned on their first epic project bled over into the next, a more modest net-zero project with a smaller budget-the Millcreek net-zero house. Simpler systems, solar photovoltaic awnings and a dedication to passive solar and thermal mass were an evolution in net-zero design. They were able to get close to net-zero by maximizing the free heating energy from the sun with large, quality south-facing windows and storing that energy in a thermally massive concrete floor, all thanks to a pesky client. "He [Conrad Nobert] brought me a copy of CMHCs Tap the Sun book and he went behind the back to my structural engineering friend Andy Smith," says Amerongen. "You can add a bunch of mass to that house really cheaply by pouring a 2.5 inch concrete overlay on the floor. So we did and we found when we did the modelling that we were awfully close to net-zero and that we could in fact get there by maximizing the passive solar potential." More passive solar energy means fewer complicated and expensive mechanical systems and a lower cost house. Since that first house in 2007 interest in net-zero homes has grown rapidly. Amerongen says there are two game changers that have really made net-zero possible - drastically reduced solar prices and a super efficient air source heat pump that works in the cold climate of Canada. This combination means Peter is developing affordable net-zero homes on lots that don't even have ideal solar access. Energy Conservation: Your net-zero home needs a high quality building envelope. You need super insulated walls and ceilings, quality energy efficient windows and it all has to be sealed up tight to prevent heat loss. Mike Turner is an engineer at Manasc Isaac Architects who built his own net-zero home: he put R70 insulation in his roof, R50 in his walls and he used quad-paned R8 windows. The home needs to be far more airtight than the average Canadian home. An average home has 4.4 air changes per hour - you should be shooting for 0.5 air changes per hour. Use energy efficient electric heating systems such as an air source heat pump made for cold climates. With no natural gas hook-up you will probably use a high efficiency electric hot water heater. And needless to say your house has to use as little electricity as possible. That means buying energy efficient appliances, killing phantom loads and being generally mindful of the electricity that you use. Passive Solar Energy: The site and orientation of your house is key. Face it south and install lots of high performance windows. Build the right sized overhangs that keep out direct summer sun, but still let the lower winter sun shine in. Use a concrete floor for thermal mass to store heat after the sun goes down. Your goal here is to harvest and retain as much free energy as possible. Energy Production : Once you have created the most energy efficient home you can and harvested as much free passive solar energy as possible then you need to produce the energy you require. Solar photovoltaic panels are the simplest most cost-effective solution for the home today. They have dropped drastically in price over the last few years and your investment will protect you from future electricity prices increases for 25 years. Buildings and electricity production together account for nearly a quarter of Canada's greenhouse gas emissions. In one fell swoop the net-zero home addresses a significant chunk of Canada's greenhouse gas emissions. In a world facing climate change and a volatile energy market the net-zero house is the house we need. This is part one of a four part series called Chasing Net-Zero. In Part 2: Net-zero beautiful we explore the evolving aesthetics and technology of net-zero homes. Net Zero 101 - Homes that produce as much energy as they consume!